Cage Titans' Amateur bantamweight champion Jacobo Apito chuckles at the thought of fighting the promotions' amateur flyweight champ Mitch Raposo, comparing fighting him to coaching a kids wrestling class. Check out Current Cage Titans Amateur bantamweight champion Jacobo Apito explain how he wants to leapfrog the featherweight division and go straight after Chris "The Bearded Dragon" O'Brien lightweight title and his beard. 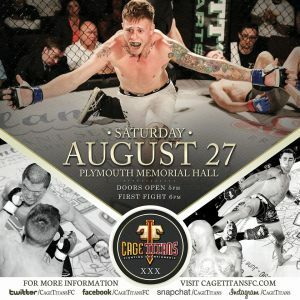 The newest Amateur Cage Titans Bantamweight Champion spoke with EC MMA News, following an incredible back and forth championship bout. Apito defeated Will Smith at Cage Titans 38 this past weekend to capture the promotions Am. Bantamweight title. He talks about the fight, what is next, and more! Cage Titans 34 Post fight - J. Apito "He tried to strangle me but I am strangle proof"
Ultimately it was the extremely competitive amateur flyweight title bout between champion Josh Meehan and J. Apito that we chose as ‘fight of the night’. Early in the bout we saw a lot of energy and aggression by the champion, while his opponent was very calm and composed throughout the bout... Apito wasted very little energy by being accurate with his strikes and explosive at just the right times. In the 4th and 5th round Meehan was swinging big looping punches out of exhaustion, while Apito was landing more and more on the slowed champion, mixing up a strong variety of punch and kicking combinations. Apito's efforts earned him the title and victory over a fighter who was thought to be in the top 3 of the region. At Cage Titans FC 30 amateur flyweight J. Apito (2-2-1) of Redline Fight Sports came away with the ref stoppage due to strikes in round 3 over Tim Hagan (1-1). "The pair traded jabs to start the fight, both getting their hands loose before cutting into each other with low kicks. A left hook from Apito landed clean, going high with a question mark kick and mid kick. A two piece landed for Apito and a spinning heel kick to the body, Hagan eating harm and coming forward with ripping shots of his own, trying to deal with the longer fighter’s use of reach. Apito landed a front kick to the body and another spinning heel kick that sent Hagan flying flat on his back; wind knocked out of his sails and Apito swarming to attack on the mat."